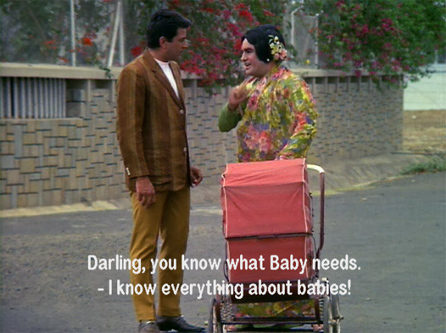 In which film do Dharmendra and Rajendranath pose as husband and wife for the sake of a baby? Asha is our winner! She knows that the film was Bhappi Sonie’s Tum Haseen Main Jawan—stay tuned for a whole post devoted to it! Posted on May 19, 2008 at 11:59 am in Hindi movies, Trivia time	| RSS feed You can skip to the end and leave a reply. The movie is ” Tum Haseen Mein Jawaan”. It also had Hemamalini, helen and Pran. I loved the movie. I have no idea which film this is from, but clearly it is something I have to see. I eagerly await the responses of those more familiar with the cross-dressing genre than I. Hope to be a winner for the next post, but what do the winner get – lol. Rajendranath’s saree is soo nice – I think he got better dresses than Hema did in this movie! ;-) Her weird blue outfit in this one is unforgettable. Shweta I would not want to be responsible for you losing your mind!